Mixed-use, walkable communities have long distinguished cities from sprawling suburbs. They have been the driving force for attracting new residents, particularly millennials, into urban neighborhoods. Recently, there has been a trend within suburban areas of developing town centers that mimic these sought-after urban features. They include restaurants, townhomes, offices, parks, music venues, and coffee shops—all within a stone’s throw of one another. The allure of urban life is growing stronger and for those millennials who are beginning to move out of cities to buy homes and start families, there is still a great desire to bring certain aspects of their urban lifestyle with them when they leave the city. Developers realize this, thus growing the movement toward urbanesque town centers that bring together many types of amenities in a contained and walkable space. There are several town centers in the Washington region’s suburbs—notably Reston Town Center in Fairfax County, Pentagon Row in Arlington County, and Kentlands and Rockville Town Square in Montgomery County. Reston Town Center is now in the process of expansion to include a second development area called Reston Town Center North, while Montgomery County has Viva White Oak in its pipeline. The appeal of these town centers stems from their ability to be all-inclusive, providing a lifestyle similar to what one would get living in a city. They differ from traditional shopping malls in that they include more than just retail stores and food courts—while one can go to a town center for shopping, there is also the opportunity to eat at a nice restaurant, grab a drink with a friend, rent office space, or even buy or rent a home. Suburban town centers live up to the “live, work, play” motto that cities have been taking advantage of for some time, but in a more sanitized and contained environment. 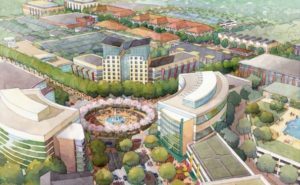 It would not be surprising if we see more and more of these town centers popping up in suburbs over the next several years.